Check out our Poster Size Football Squares with Quarter Lines! 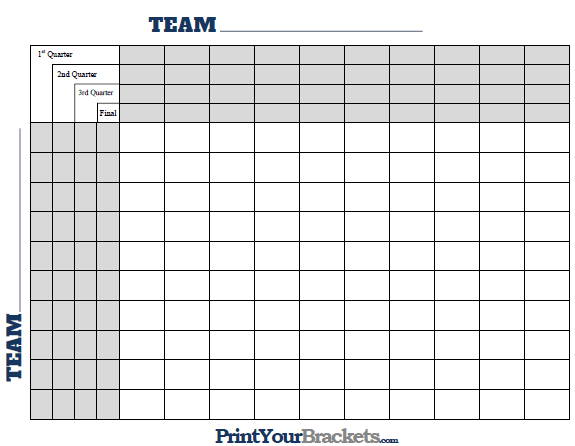 Try our new Super Bowl Squares Generator, where you can add team names and logos, change the color of your grid, and even add prize information and special notes before printing! A quarter line Super Bowl Square office pool is only slightly different than your typical Super Bowl Squares, in that you will draw different numbers for each quarter, meaning that a persons particular square will likely have different numbers for each quarter. 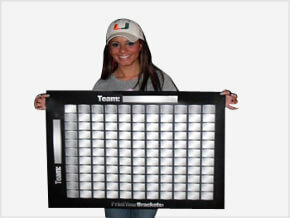 Sell each square for a set dollar amount until all squares are full, a player may buy as many squares as they wish. Once the player pays for the squares they are to write their name in the squares of their choice. Some people will draw the numbers for the top column and the side column before having the participants choose the squares. This is the incorrect way of doing this as it provides an extreme advantage to the people that get to choose their squares first. You can see if you look at our "Best Super Bowl Squares" article that there are obvious advantages to having certain numbers. Once all the squares are full it is time to set up the drawing. This can be done in many ways, listed below are 2 examples. After determining the drawing method, draw the numbers one at a time placing the numbers from left to right starting with the first gray square box in the top row labeled "first quarter", continue across the top row until the numbers are gone. After that is complete you will redraw the numbers, this time placing the drawn numbers in the gray square boxes in the left column labeled "first quarter", starting at the top. Redraw the numbers again in the same manner, this time placing the numbers in the "Second Quarter" gray boxes. Continue this until all four quarters have been drawn. Example: At the end of the first quarter the AFC team has 17 and the NFC team has 14. Go to the AFC top row of numbers and find the number 7(last digit of 17) then go to the NFC left column of numbers and find the number 4(last digit of 14) find where these two numbers intersect on the grid and the name in that square wins the first quarter. There are a few different ways to split up the prize pool , make sure this is discussed before selling the squares. The most common method is to give the winner of each quarter 25% of the prize pool. If you sell each square for $1 the winner of each quarter will win $25. It is possible that a player can win all four quarters and the whole prize pool. Be sure to discuss what is going to be done in case of an overtime, some people will just ignore the overtime score, some people will substitute the overtime score for the 4th quarter, and others will then divide the prize pool by 20%. Once again to avoid problems make sure all of this is discussed before selling the squares.